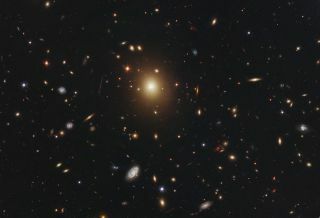 The giant elliptical galaxy in the center of this image, taken by NASA's Hubble Space Telescope, is the most massive and brightest member of the galaxy cluster Abell 2261. Image released Oct. 25, 2012. A faraway galaxy's core is the largest ever seen, and it may have been puffed up by the merger of two black holes, a new study reports. The core of the elliptical galaxy A2261-BCG is about 10,000 light-years across, astronomers using NASA's Hubble Space Telescope discovered. That's unexpectedly huge, even for a galaxy 10 times wider than our own Milky Way. The core is also strangely diffuse, without a concentrated peak of light around an obvious central black hole. That last detail is a bit of a surprise, since supermassive black holes are thought to lurk at the core of most, if not all, galaxies. A2261-BCG (short for Abell 2261 Brightest Cluster Galaxy) is 1 million light-years wide and is found 3 billion light-years from Earth. Its strangely bloated core is three times larger than the centers of other extremely luminous galaxies, researchers said. The astronomers think a black hole merger — involving objects containing several billion times the mass of our sun — may have puffed up the galaxy's core. This could have happened in two different ways, they say. In one scenario, the merger gravitationally stirred up and scattered the stars. The black holes lost momentum in the process and fell into each other, forming a supermassive black hole that resides at A2261-BCG's heart today. In the other, the black-hole merger created gravity waves, which are ripples in the fabric of space-time. These waves radiated most strongly in one direction, booting the merged black hole from the galaxy. "The black hole is the anchor for the stars,"Lauer said. "If you take it out, all of a sudden you have a lot less mass. The stars aren't held together very well and they move outwards, enlarging the core even more." The ejection theory may sound far-fetched,"but that's what makes observing the universe so intriguing — sometimes you find the unexpected," said study lead author Marc Postman, of the Space Telescope Science Institute in Baltimore. The research team is now actively searching for evidence of A2261-BCG's black hole, if it exists. The astronomers expect that material falling onto a black hole should generate radio waves, so they're probing the galaxy with New Mexico's Very Large Aray radio telescope. The study was published in the Sept. 10 issue of The Astrophysical Journal.